PSOMOLADEA OE: A small Mediterranean restaurant in the picturesque bay of Avlemonas, with unique atmosphere! 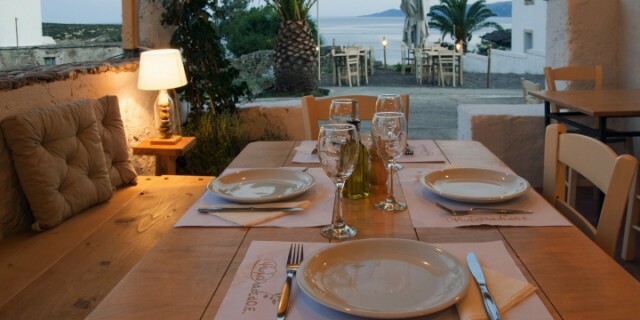 Greek Cuisine, Mediterranean cuisine, with fantastic view of the sea and exceptional music. Fresh ideas, modern Greek cuisine in a beautiful environment. Ζefyros: Throughout the day with a view to the shipwreck, at the beautiful Diakoftienjoy the tasteful delicacies of Voula and George. Chop house with sea food and meat, cooced food and fresh fish, Zefyros is an excellent suggestion. Platanos: In the square of Mylopotamos, the traditional ceilinged cafe with its unique architecture can be enjoyed from April until the end of September. Delicious Greek recipes and an extensive menu with local natural ingredients created to be enjoyed beneath the shade of the plane trees in the beautiful square Mylopotamou. Panaretos: Dinner at Panaretos in the Plateia of Potamos is a must when visiting Kythera. If you are a little organised and visiting in the right season be sure to book a table for one of the Friday night live music shows – the combination of dining and music is unforgettable! The food is just like grandma used to make and boasts lots of fresh local ingredients. The menu also offers evolved and modern dishes for everyone’s palate.